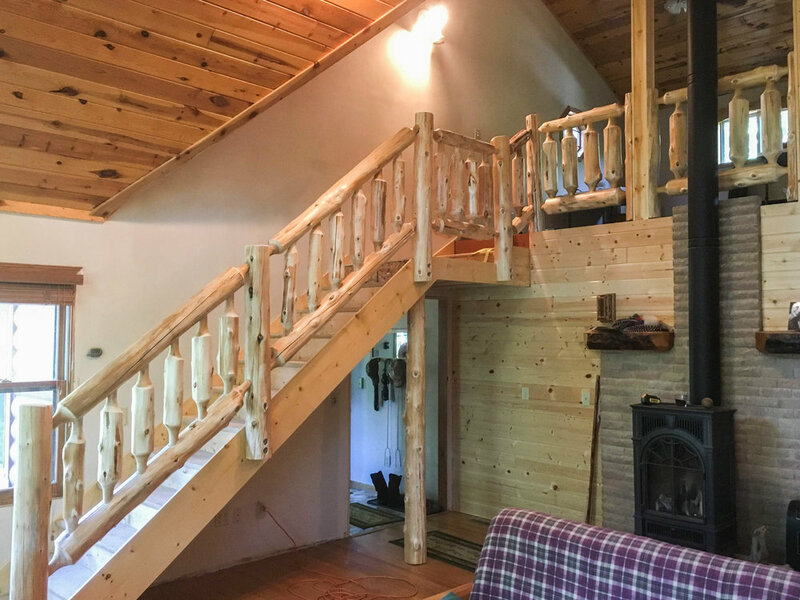 Soderlund's Wood Mill | Cedar log railing custom built for your home, cabin, deck, or business. Why use Soderlund’s Woodmill Log Cabin Railing? Soderlund’s Woodmill is owned and operated by wood smith brothers Josh and Jason. As the owners of this company we personally work with our customers from start to finish to ensure that your project receives the time and attention it needs. We love the craftsmanship and challenge of working with wood and that shows in the time, care, and attention we give our products. 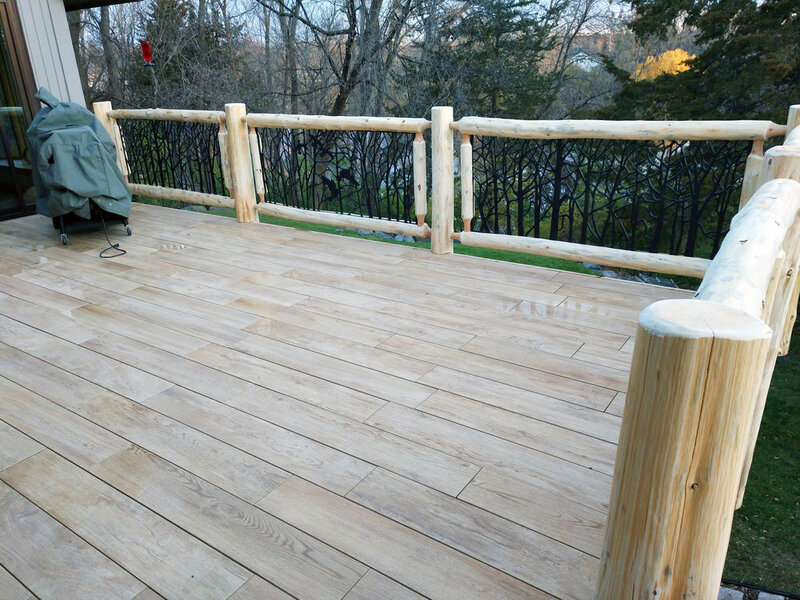 We want to help you surround the spaces you want to protect with the natural beauty of cedar log railing. 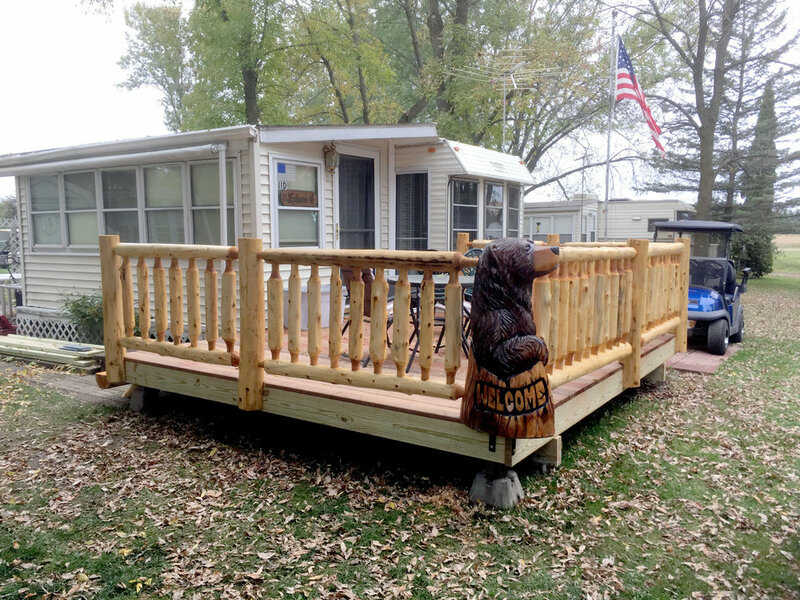 We offer custom built log railings that fit the requirements of your log cabin, house, loft, deck or porch. We walk you through every phase of the project and we have the experience and problem-solving capability to make your exterior or interior railing project come together. 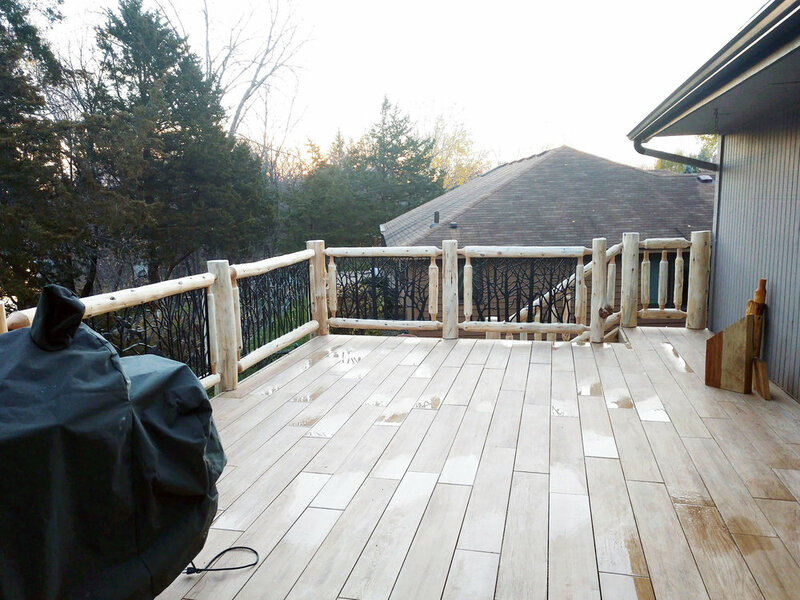 All rails, spindles, and posts are made of Northern White Cedar ensuring the highest quality of wood available. We know your time is valuable, so we come out and make the proper measurements, we tear out existing railing, and we install the new railing so all you have to do is enjoy the finished product. Our hand railing is designed to meet code requirements and since we can provide installation, this ensures that when your railing project is completed, it will have the functionality and look you will be proud to show off. We never use turned or machined logs in creating our natural cedar log railing. Each log is hand selected and peeled before it is crafted using our on-center tenon process. This ensures that every railing section is unique and beautiful just as nature intended. 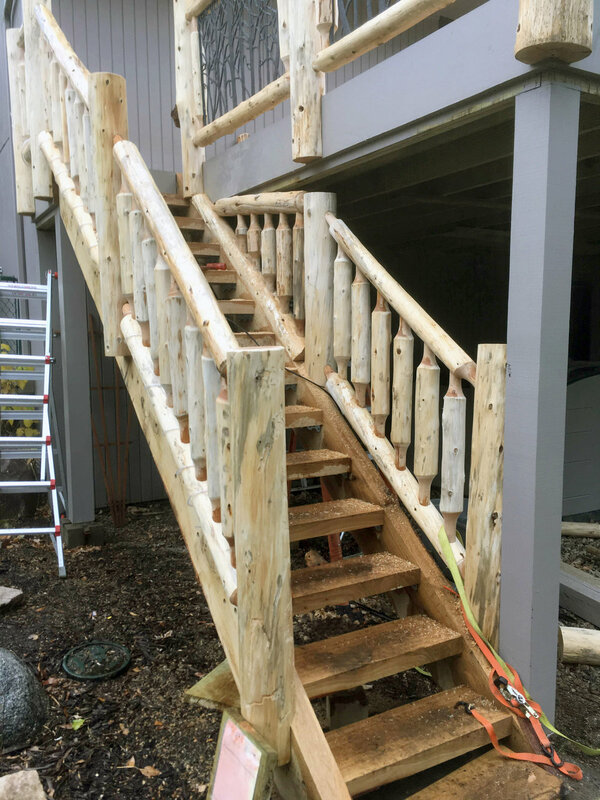 We can precisely cut natural log railing sections to fit a wide variety of different panels for any deck, interior railing, or porch space. By using modern CNC machining in this process, we can ensure that although the logs may have a wide variety of shapes and sizes the panels will always have a great fit. We can create rustic railings for an angle up to 37 degrees and any length of stairs. All of our railings meet commercial code and we can customize the newel posts to fit a wide variety of applications. We believe that stair railing should be both beautiful and secure, so we go the extra mile to ensure that our stair railing is strong and beautiful. White Cedar is a naturally rot resistant wood and is excellent at withstanding weather and seasonal changes on porches, decks, and walkways. In Minnesota, our weather can be extreme and take a toll on anything that is outside. We work to make sure that our railings are made from the best possible materials to withstand the harshness of the upper Midwest climate. Another reason we use White Cedar is because of its beauty. Each piece can have multiple colors, rustic knots, and unique patterns left from beetles that had once lived in the bark. Whether it is used for interior railing, exterior railing, or log furniture, White Cedar is a premiere choice of wood for your log project. If you are looking for a log railing for your home, cabin, or commercial space, Soderlund’s Wood Mill has you covered. The same care, attention, and expertise we pour into our carvings, log furniture and log swings will be used when building your log railing. We use the best available materials along with our creativity and craftsmanship to make sure your railing has the natural beauty we all strive for when working with wood. If you are looking to replace a log railing or are looking to install a new one, the type of wood you use does matter. Natural White Cedar is a premium choice for railing because it naturally resists weather, insects, and has less of a tendency to retain moisture. Rotted sections of log railing are not only ugly but can be dangerous. We make sure that our railings exceed code requirements and will withstand extreme weather. We want to give you the confidence that you will have a product that will last. Log railings are used in many parts of the home. Protecting stairways, patios, lofts, decks and walkways is essential for peace of mind. Every railing is unique and hand-made, ensuring that your space is protected and the railing fits as it should. We offer installation of our log railing. 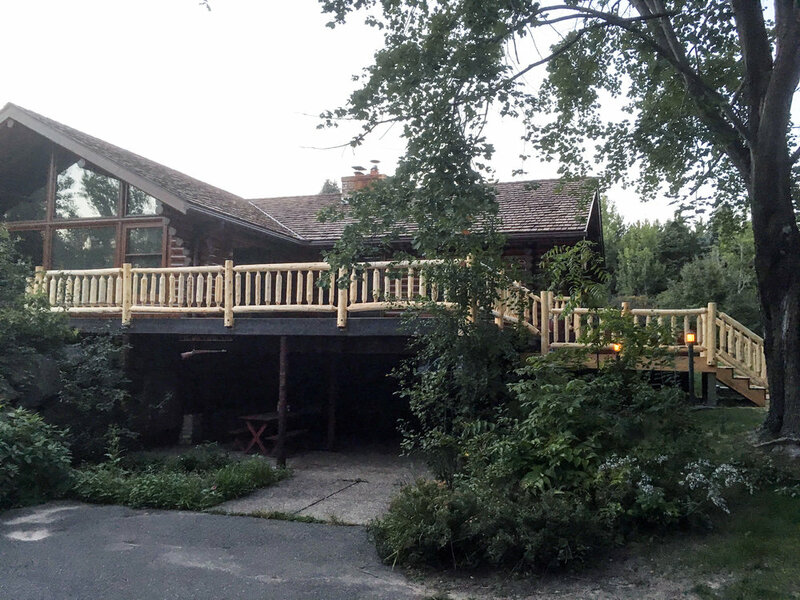 We know what it takes to ensure the log railing is installed correctly and we can make sure that when we leave, your railing will hold up to weather demands and daily wear and tear. 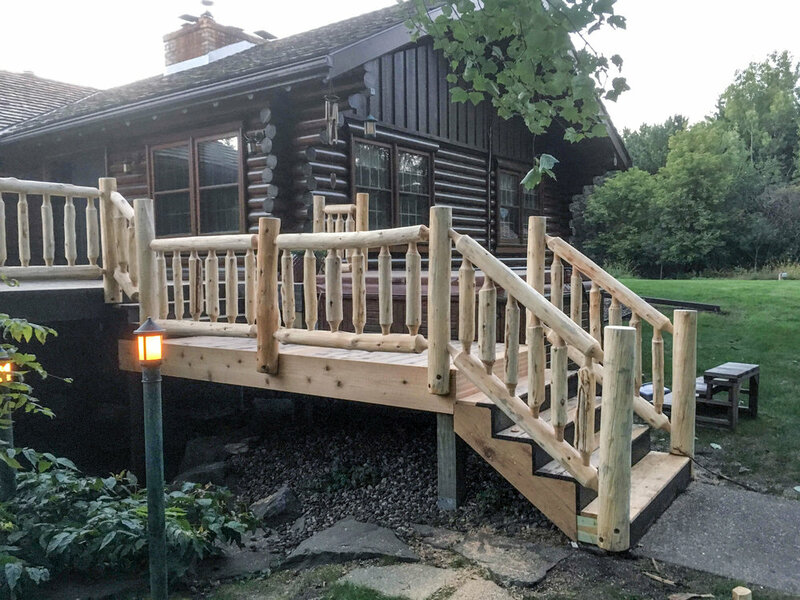 If you are a contractor or enjoy working with wood and would like the option of installing it yourself, we can make log railing to your specifications. We can give your place of business the special ambiance you want. We know that railings are an important part of making your deck, patio, stairs, or walkways safe while also adding a comfortable and pleasing feel to your space. We take care of the removal of old railing if needed, measure for new railing, and complete the installation. We take pride in our work and make sure that when we are done the railing is straight, level, and reflects the time, care, and attention you pay to your business.